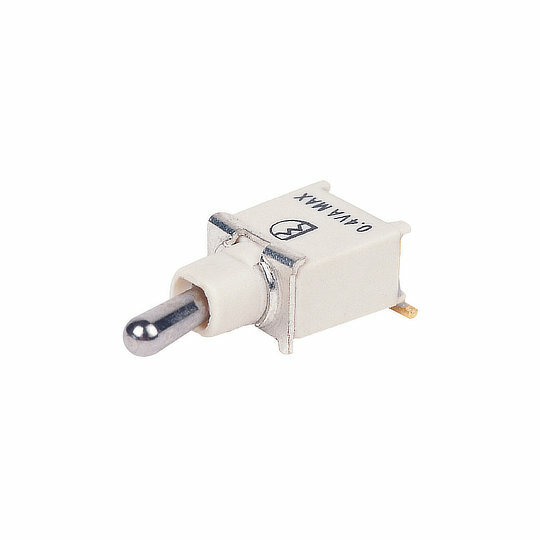 The 2B series of sealed sub-miniature toggle switches (SMT) from Dailywell are single pole switches with double throw operation and latching or momentary actions. Designed for surface mount technology the 2B series is available in antistatic tape or reels making it perfect for flow soldering and cleaning processes. Electrically rated to 3A at 120VAC/28VDC or 1A at 250VAC with silver/gold over silver contacts, or low level at 0.4VA at 20VAC/DC with gold contacts. The 2B series has a mechanical life of 30,000 cycles an IP rating of IP67 and a choice of 5 metal or plastic actuator styles. The 2B series is perfect for applications such as Telecommunications, Instrumentation, Networking Equipment, Computer and Server Equipment, Medical Devices and Audio-Visual Equipment.